Cheryl Barr, CEO of Penn State Federal Credit Union, presents Mel Curtis and the YMCA of Centre County a $5,000 check for the YMCA of Centre County’s Backpack Program. 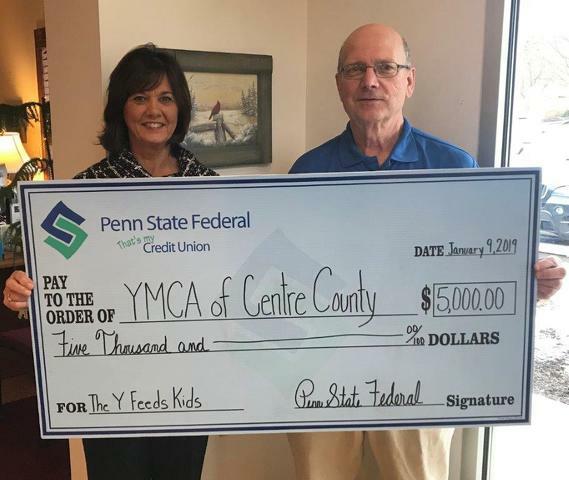 BELLEFONTE — Penn State Federal Credit Union recently donated $5,000 to The Y Feeds Kids Weekend Backpack Food program through the YMCA of Centre County, according to a press release. The program was started during November of 2014 in one school district and has increased to eight local school districts. Throughout the 2017-18 school year, a total of 299,250 meals and 129,150 snacks were provided to more than 1,300 children through the Weekend Backpack Food program. Aside from oversight and food ordering, the program is operated by volunteers who pack the backpacks and deliver them to the schools. Each Friday afternoon during the school year, participating students receive a backpack containing meals and snacks to take home with them for the weekend. On Monday, they return their empty backpack to the school so it can be refilled for the following weekend. “The Penn State Federal family is pleased to be a part of the Backpack program again this school year. Each week our staff members participate in the packing process, which allows us to see the impact of the program as the amount of backpacks grow in numbers. A child fed for the weekend is a success story. Thank you to the YMCA for being there for the kids,” said Cheryl Barr, CEO of Penn State Federal Credit Union. No child is turned away from the Weekend Backpack Food program. Parents may receive more information about enrolling their child/children by contacting their child’s school. The program serves Bald Eagle, Bellefonte, Moshannon Valley, Philipsburg-Osceola, Penns Valley, State College and West Branch Area school districts. Penn State Federal, a member-owned and operated financial institution that has been serving the Penn State community since 1959, offers a variety of personal and business related financial products and services. Membership is open to Penn State University employees, students, retirees and their families in addition to a variety of select employer groups.